"Modern farmhouse" is the name for this hybrid style, combining modern color schemes, shapes, and materials with the rustic warmth of untreated wood, hand-hammered metal, or clay pots. It can be interpreted in an infinite number of ways, with different levels of integration between modern coolness and farmhouse nostalgia. Here are a variety of modern farmhouse examples to show how flexible and beautiful this unexpected combination can be. On the minimal side of this style, you have bathrooms like this one by Min Day Architects, via Houzz. A clean white and grey bathroom turns into a spa-like haven with the single addition of a rough-hewn, natural wood farmhouse bench. This bathroom features Benjamin Moore's Seapearl on the walls. This Godrich Interiors bathroom also features a single farmhouse element: the sink. The rest of the space is all white and marble, a very contemporary style. The oversized sink works to bring some volume and visual interest to an otherwise understated bathroom decor. 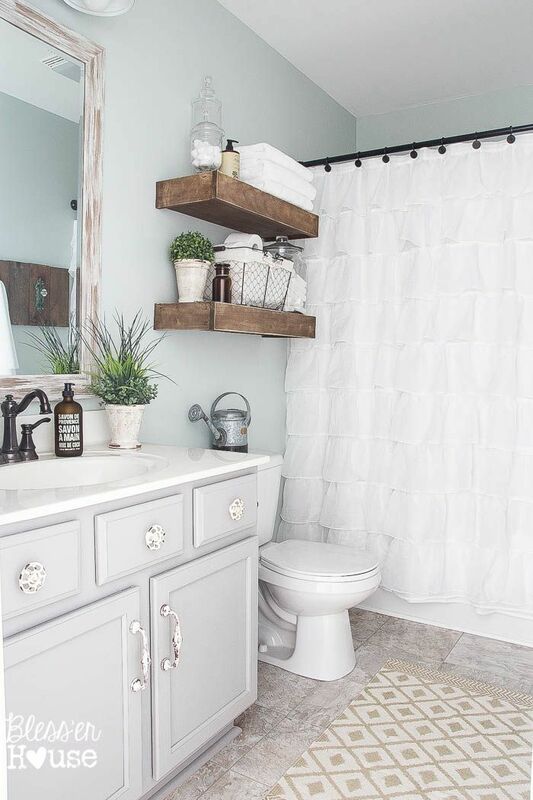 In this beautiful powder room by Sypsie Designs, several farmhouse touches are integrated into a modern color scheme. The wood shiplap ceiling, oversized sink, traditional mosaic tile, and framed mirror bring plenty of personality and style, without feeling too nostalgic. Even in tiny spaces like this one, farmhouse touches bring lots of life and interest without overwhelming the decor. This tiny bathroom by Envi Interior Design Studio, via Houzz, has more farmhouse than modern, but still meets the definition of a modern farmhouse. The small space is made to look bigger, thanks to a reflective tile in a neutral shade, and a large frameless mirror. The oversized farmhouse sink exposed lightbulbs, and stone floating vanity give the bathroom a retro, almost industrial feel. The mix of red, blue and neutral hues give it life and joy, too. Without the rustic bench and wicker baskets, this bathroom, photographed by Hannah Blackmore, would feel a little empty and cold. (Okay, the puppy helps too!) Luxurious marble contrasts with humble wicker, and modern square shapes are balanced by the rounded wood stool. In this space, found on Roomble, the farmhouse and modern areas are placed side by side, tied together with a beautiful black and white mosaic tile and black retro-style hardware. The modern white shower with subway tile contrasts with the painted wood shiplap and farmhouse-style wood vanity. A subtle marble countertop brings a touch of luxury. This modern remodel of a Kent, UK farmhouse features this beautiful powder room with bold turquoise paint and complementary copper basin. 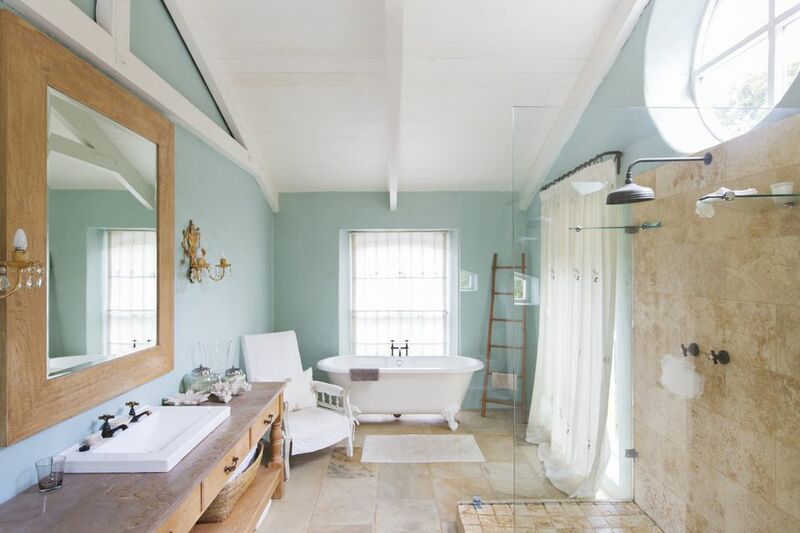 The gorgeous basin is what keeps this bathroom tied to its farmhouse past. This Bridget Reading ID design, via Houzz, shows that you don't need a lot to bring modern and farmhouse styles together: sometimes, a single item will do the trick. This classic modern farmhouse design by James Nesbitt-Weber Interior Design features a salvaged oak double vanity, marble countertop and herringbone floor, and white-on-white beadboard walls. The addition of aged steel-framed mirrors and industrial-style sink hardware gives this bathroom an extra industrial edge with a personality all its own. If you prefer the emphasize the retro quaintness of the farmhouse style rather than the cool shades and straight shapes of the modern style, you will love this example from Bless'er House. The modern color scheme keeps white in the center, while farmhouse touches abound: the frilly shower curtain, the wooden shelving and mirror frame, and the cute crystal drawer knobs. Yes, a farmhouse bathroom can still look ultra-modern if you balance modern and farmhouse elements in the right way. This example, designed by Brandi Hines via Houzz, features a stylish steel-framed shower and minimal freestanding tub. The farmhouse touches come from the cowhide chair and small wooden shelf, along with the wall-mounted retro hardware for the tub. This minimal yet feminine modern farmhouse bathroom by Isabel Lopez-Quesada features a farmhouse washstand and porcelain vessel sink, a beautiful vignette with empty jars, wall-mounted retro hardware, and modern marble tile for a luxurious finish. Fresh flowers give this bathroom a touch of organic femininity. The barn door is making a comeback in modern design, and this bathroom uses it in an original way: attached to a full-length mirror rather than a door. This design by Irwin Builds uses reclaimed wood with a neutral color scheme for that modern/rustic combination. The mirror hides extra storage space, too. The modern farmhouse style isn't just for grownups: this design by Brandi Hines, via Houzz, shows that kids' bathrooms can be just as fun and beautiful. The large farmhouse sink with two faucets takes less space than a double vanity, and the exposed plumbing adds to the rustic style. This bathroom by Feldman Architecture shows how modern and farmhouse styles can be in perfect harmony. The dominant white is made warmer with rustic wood touches: the tub surround and the floating shelf vanity. Fresh white flowers in rustic vases and vessel sinks add detail and volume to the vanity area. Along with the unusual tub shape, this modern farmhouse bathroom by Chango & Co. features rustic touches of unpolished wood and hand-woven cotton. White is still a dominant color, as in most of the modern farmhouse designs, but is livened up by neutral wood shades and green touches.